Advanced anti-aircraft missiles in the hands of Syrian Islamist rebels could be used, after they win the civil war there, against neighboring countries and even against commercial passenger planes. It seems as if the attempts to get back advanced weapons from Libya played a central role in the mission that led to the Benghazi incident. As Libya also showed, once rebels overthrow a government, U.S. attempts to ensure its arsenals aren't opened to terrorists abroad are unlikely to succeed fully. On how fear of Syrian Islamist rebels getting advanced weaponry and attacking the country's neighbors in future has shifted U.S. policy see here. On the spread of weapons from Libya, see here. So what is this issue all about? Fortunately, there’s a remarkably useful site in the UK called Brown Moses that professionally assesses this and other weapons’ issues in the Middle East. If you are interested in such things by all means go there. Briefly, the story is this. 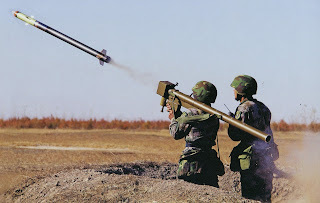 The weapons are generically known as Manpad for Man Portable Air Defense Missile. The equipment captured in Libya and from the Syrian army in Syria or obtained by other means consists of four types. The SA16 is a short-range version which has been captured by the rebels, specifically when they took the giant Syrian army base in Aleppo. The only weapon from Libya is the older SA7, since the Libyans didn't have more advanced versions. It has been reported--though all such figures are not necessarily reliable--that about 5000 SA7 missiles were destroyed by the U.S. and other forces but that about 15,000 remained missing. The missiles are not usable forever, and some of those in the Libyan arsenal were very old, but apparently many of them would still work. Here's an example of a reasonably reliable report saying that a large number of SA7s were delivered to Syrian rebels through Turkey last September. Joel Silva/Folhapress, via Reuters. 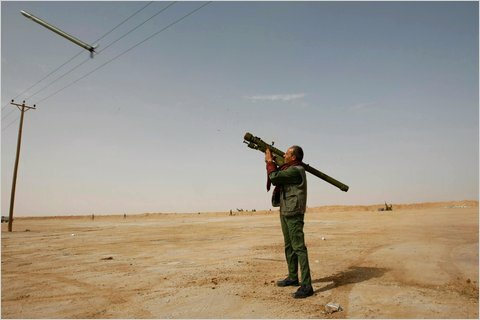 A rebel fires a rocket at a Libyan air force jet near on March 2, 2011. Then there's the Chinese FN-6 , standard for the Chinese air force, which was used to shoot down a Syrian transport helicopter at Menagh Air Base near Aleppo. How did that one get there, through the U.S.-Turkish-Saudi-Qatari arms supply program or another way? 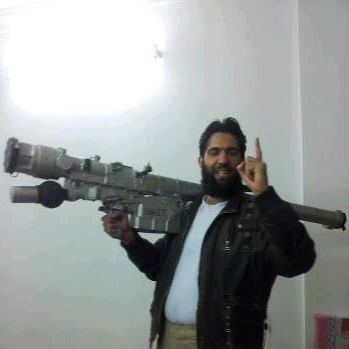 It is claimed that Syrian rebels shot down two military helicopters with this weapon. And this brings us to the best of all, the SA24. While some have been misidentified, they were obtained from the 46th Syrian regiment base west of Aleppo. There are a number of videos available though in many cases it is not clear whether the rebels also have the grip stick without which the missile is inoperable. Some videos that purport so show operational SA24s are merely training equipment that cannot be used in combat. Nevertheless, the rebels definitely have such equipment. As the Brown Moses site points out, new MANPADS have arrived through Turkey recently. The Guardian,quotes an opposition leader as claiming that "a Syrian army helicopter and a Mig warplane had been shot down in the past two days, for the first time by imported missiles...`released from the Turkish warehouses. These are weapons the opposition had purchased previously but had not been allowed to take across the border.'" Reuters quotes several rebel commanders and fighters as saying the same thing. New information: According to the UN experts' report on smuggling from Libya, SA-24s were found--contrary to other sources--among weapons being sent to the Syrian rebels on the intercepted Letfallah II ship. Now these more advanced weapons were reportedly bought in Croatia by the Saudis. The Saudis back the Salafists so presumably the new arms are in the hands of forces more extreme than the Brotherhood. "Generally the opposition in the south have been poorly equipped compared to the groups in the north.... As the opposition in the north captured more bases and more equipment it allowed them to attack increasingly heavily defended bases, with the capture of anti-aircraft weapons, like MANPADS, allowing them to defend from attacks from the air, which in turn meant they could deploy captured artillery and tanks, which were essential in attacking heavily defended bases." The rebel groups in the north are dominated by the Muslim Brotherhood and Salafists who are better armed than the non-Islamist sections of the opposition. If things go on this way--and they probably won't change--when (not if) the rebels win (which might take a long time), the well-armed, anti-American, anti-Christian, and antisemitic Islamists will take over Syria. And, more immediately, what kind of MANPAD system are the rebels getting through Turkey--with U.S. approval--and exactly which groups hold these weapons? The al-Qaida affiliates? Salafis? Muslim Brotherhood? Incidentally, while Jabhat al-Nusra, the Syrian affiliate of al-Qaida has not been seen with MANPADS, it has been shown to have obtained some of the Croatian heavy weapons distributed within Syria. These were supposedly to be kept out of its hands due to U.S. policy of not letting the arms coming into Syria through Saudi-Turkish efforts get to such dangerous enemies. The new proclamation by the leader of al-Qaida in Iraq, Abu Bakr al-Baghdadi, that Jabhat al-Nusra is part of his organization is worrisome. Even though it has long been known that Jabhat al-Nusra was affiliated with al-Qaida, if this statement is true it is now directly under an organization responsible for the deaths of scores of American soldiers and civilians in Iraq. The earlier declaration from two dozen insurgent Salafist groups in Syria which defended Jabhat al-Nusra against a U.S. attempt to isolate it is worrisome. How can Jabhat al-Nusra be isolated when it has so many allies? How will advanced weapons be kept out of al-Qaida's hands when it is being given to friendly Salafist militias? In other words, in a real sense, albeit unintentionally, U.S. policy is backing al-Qaida. It is not true that the United States supported Usama bin Ladin in Afghanistan, since it was backing different groups and at the time bin Ladin's backing was coming from Saudi Arabia. But now, after September 11, the United States is not only again involved in an insurgency where bin Ladinist forces are as well but also many of the other groups are sympathetic to them. What is most dangerous is not that Salafist groups, including al-Qaida, will take over Syria politically but that they will be given a relatively free scope to act as they please. The U.S. government is basically putting its hope on a Muslim Brotherhood-led coalition or even a Muslim Brotherhood regime restraining al-Qaida, which might happen if Jabhat al-Nusra attacks the new Syrian regime and thus faces repression at its hands.